Report from the field : We conducted health camp to the parents, kids and local communities. 150 person participated in the health check up we distributed medicine to them. We distributed 80 also Dignity kit and 50 pcs mosquito Net for supported kids mothers and local women. The local administration office and police office also helped us for the program. 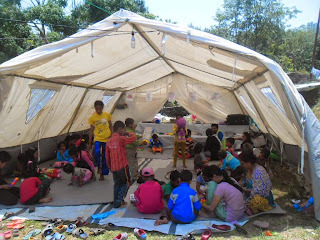 We gave them 7 pcs tent for our CLASS supported kids family and 10 additional tent for a nearby village. When we return we came to see "Kashab" village. His village is totally collapsed and no NGO's, nor support reach there. There are 108 family in his village. All home are damaged so they are requesting for more support.